A spectacular large map of the East Indies. 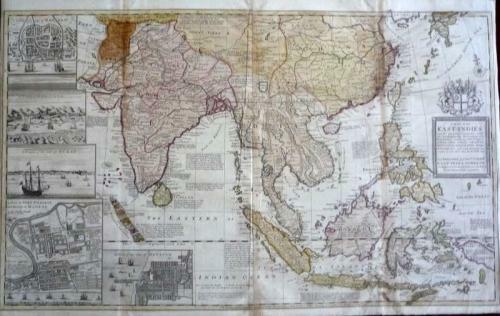 Map of southern Asia which details the early development of the English East India Company. The map extends from the Malabar Coast of India to southwestern Japan. Five insets on the left show a plan of Bantam (the most important Javanese port for the spice trade with Europe until its harbour silted up in the late 18th century); prospects of the ports of Goa and Surat; a plan of Batavia [i.e. Jakarta]; and of the Fort of St. George and the city of Madras. The East India Company's coat of arms appears above the dedication to the far right. Moll also provided many informative and interesting annotations across the map in particular which European country had economic interests in this region. Relief is shown pictorially. Dedication in the title box: To ye directors of ye Hon.ble. United East-India Company, this map is most humbly dedicated by your most obedient servant, Herman Moll, geographer. Imprint on map: Sold by H. Moll over against Devereux Court between Temple Bar and St. Clements Church in the Strand by Iohn King at the Globe in the Poultrey near Stocks Market. The map is very good condition with good margins that have some small repairs. There are reinforcements at the folds on the verso. There has been some colour deterioration, but the paper is supple and stable - the faults are reflected in the price.